The HME Ahrens-Fox difference is built on experience, innovation and a drive to produce the best apparatus available in the industry the today. Through total vertical integration of our design, engineering and manufacturing capabilities, HME Ahrens-Fox has the capability to immediately integrate the latest technologies and innovations in advanced engineering. 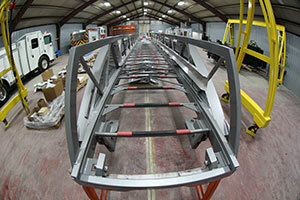 HME Ahrens-Fox introduced its exclusive line of HME engineered and manufactured Aerial Products in 2014. HME Aerial Products feature HME built sectional steel ladders, and turntables. HME has also introduced a number of advanced technologies into its aerial designs including its proprietary, patented pending, rung-alignment technology. Other integrated technologies include joystick controls, touch-screen valve controls and advanced sensoring systems to improve ladder control and safety. HME Aerial Products range of models includes everything from compact aerial designs, platforms to its 111-foot ladder, the HME HAF111L. HME stainless steel body panels feature modular, bolted construction with aircraft quality screws and lock nuts for longer and more durable service life. In the event of damage, only panels and sections that are damaged need to be replaced. Panels and patterns are stored on HME computers to make reproduction of any panel or component fast and easy. Replacement panels can be shipped to local repair facilities to put damaged fire apparatus back in service quickly and economically. 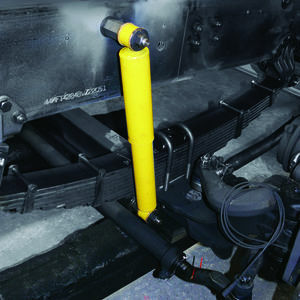 HME has introduced an automatic, in-cab fluid monitoring system on all of its fire apparatus and chassis. The integrated monitoring system provides an early warning of low engine oil and power steering fluid. The HME fluid monitoring system detects actual fluid levels, and not temperature (which only alerts operators of a problem that has already occurred). The remote oil level sensor is mounted at a higher-level than traditional systems to provide an earlier warning. 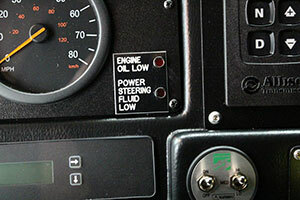 The system offers additional convenience, and eliminates need to open the engine to check levels. It is still important to manual check engine fluid levels as part of a regular maintenance program. 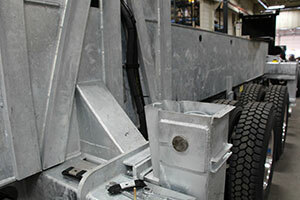 HME Ahrens-Fox now offers an additional corrosion resistance option for its complete line of custom chassis. 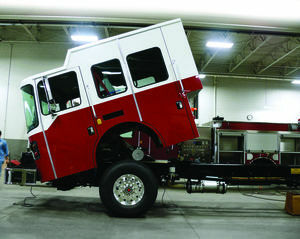 Hot-dipped galvanized frame rails, cross-members, rear support structures, tank cradles and chassis components add years of protection and service life to HME Ahrens Fox chassis and fire apparatus. While standard paint and metal coating processes can only slow the damage of today’s corrosive sodium and calcium chloride salt spays, HME Ahrens-Fox now offers the superior of corrosion resistance of the hot-dipped galvanization, that can protect your fire apparatus investment for decades to come. HME Hydra Technology™ introduced an exclusive pump module design capable of delivering maximum water flow– along with optimal versatility. Stainless steel piping, valves, panels, and framework were engineered to provide years of durable, trouble-free service and easy maintenance while aircraft quality valve controls offer maximum efficiency and ergonomics, as well as smooth and trouble-free linkage for valve operation. HME Hydra Technology™ components can be configured to offer optimal ergonomics and operator efficiency and its compact design proves more space for equipment, water, and essential gear. 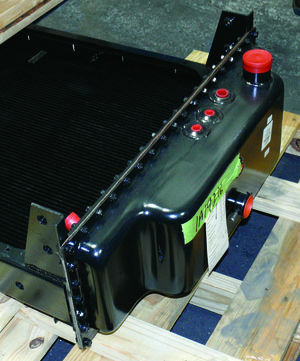 Fire apparatus cooling systems are often required to withstand extreme operating temperatures over long periods of time. To ensure optimal engine cooling and prevent engine damage or failure, HME has designed a cooling system made to endure these extreme conditions. Engineered with a higher density of cooling tubes and Modine Beta-Weld dual bond construction, HME radiators offer improved cooling performance and dependability over other designs. HME’s exclusive fan shroud, mounted to the engine rather than the chassis and frame, provides fixed and tighter tolerances to reduce fan swirl and concentrate air flow directly to the radiator for improved cooling efficiency. Large tankers and tenders have always presented challenges in terms of stability and crew safety. HME engineers worked directly with Meritor WABCO, a worldwide leader in suspension and braking control systems, to develop an electronic stability control system to address these critical challenges. The technologically advanced control system constantly compares a vehicle’s actual movement to performance models through its integrated sensors. The system will prevent loss of control by selectively applying brakes to realign the vehicle in accordance with the driver’s intended direction of travel. New transportation regulations are already on the way that will mandate suspension control systems in the near future – systems that HME has already integrated into its fire apparatus, tankers, and tenders. 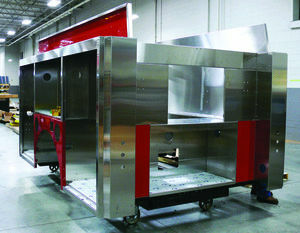 HME is the world’s largest single-source producer of custom, stainless steel fire apparatus. 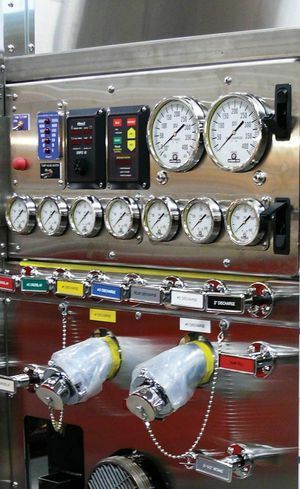 HME uses stainless steel almost exclusively in the construction of its fire apparatus bodies and components because of the many advantages and benefits stainless steel has to offer in the tough and harsh environments fire apparatus face on an almost daily basis. For starters, stainless steel is as light or lighter than extruded aluminum constructions. Stainless steel is also extremely resistant to corrosion and rust and resists today’s highly corrosive chemicals, salts, and foams, as well as long exposure to water, far better and longer than extruded aluminum or common steel. Stainless steel also resists cracking from pressure and stress and, unlike aluminum constructions, stainless steel will not fracture or crack from chassis twisting or vibration. 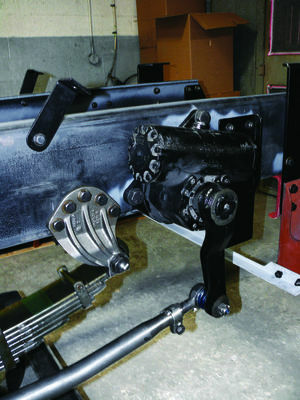 While tilt-cab engineering and cab-forward design provided a platform to significantly improve fire apparatus maneuverability and handling characteristics, HME took another major step forward in enhancing fire apparatus turning capability with the development of the HME SFO® (Short Front Overhang) Chassis. The HME SFO® chassis, designed originally for Wildfire and Interface applications, dramatically improved steering characteristics. Today, HME fire apparatus offer the tightest turning radius in the industry – across the board – with a 52˚ turning/cramp angle with tires mounted. In addition to improved turn radius, HME engineers also enhanced the dependability and safety of HME steering systems with the integration of dual steering-gear designs. Touchscreen pump controls were introduced to the industry for the first time on the HME Scorpion™. 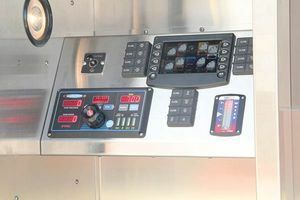 Touchscreen controls offer simplified and more responsive valve and pump control while allowing the controls to be relocated to a position that provides operators with protection from being knocked off the platform by charged lines. The pump valves of the HME Scorpion's™ big-bodied split shaft pump are all networked using non-proprietary SAE J1939 controls.